This entry was posted on July 23, 2014, in Czech & Slovak Republics, Destinations and tagged Czech Republic, Franz Kafka, Jewish Cemetery, Kafka, New Jewish Cemetery, Prague, Travel. Bookmark the permalink. Prague’s Old Jewish Cemetery is a major tourist attraction. 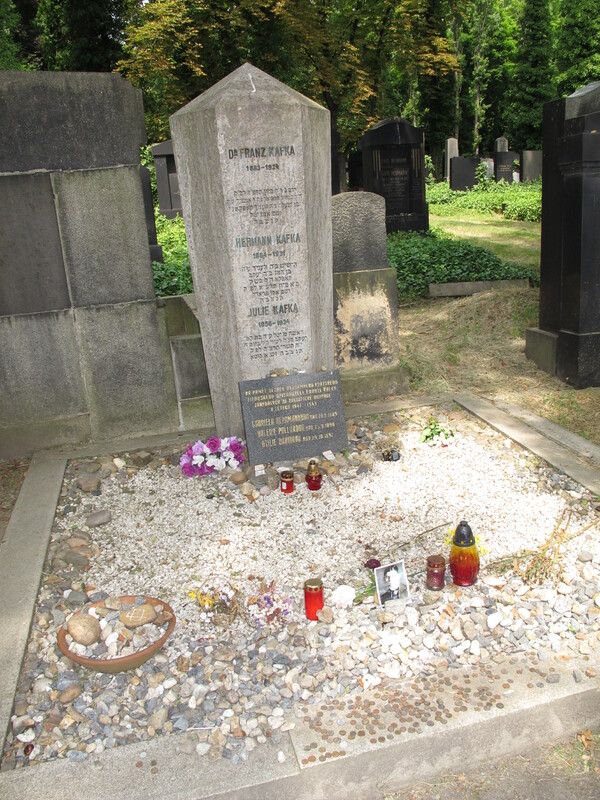 But to fans of Franz Kafka, the pilgrimage is to Prague’s New Jewish Cemetery, reachable by tram from the city center. I was always curious to see it, but now, unfortunately, I had a reason other than a Kafka pilgrimage. My uncle, Ctibor, died in early 2013, and is buried there. So, this time, it was important for me to see the cemetery and to visit Ctibor’s grave. I wasn’t prepared for what I saw. In contrast to the Old Cemetery, with its layers of ancient tombstones from as far back as the 15th century crowded nearly one on top of the other, this cemetery was open and airy. A wide, beautifully graceful, tree-lined central avenue bisected the cemetery. Dating from 1891, the avenues are lined with imposing and sometimes ornate monuments, some architectural in feel, complete with trellises, others up to five feet high, reflecting styles from the turn of the century and beyond. Some sites were laden with ferns or other bushes growing. After paying my respects to Ctibor by placing a stone on his grave site, which is Jewish tradition, I went in search of Franz Kafka. Kafka’s monument resembles a small obelisk with his name and the names of his parents – Hermann and Julie — engraved in the stone, along with dates of birth and death, and a Hebrew inscription under each name. Resting at the bottom of the obelisk is a black marble plaque with the names of Kafka’s three sisters who died in the Holocaust: Valerie, Otilie, and Gabriele. On top of the grave site was a curious mélange of mementos placed in tribute, including real and plastic flowers, small copies of Kafka’s photo, oil lamps, and a large ceramic bowl filled with varied-size stones that Jews traditionally place on a grave site.